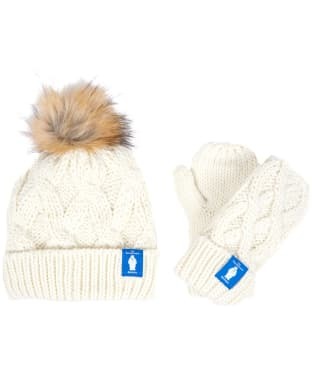 The perfect gift for the adventurous little girl, the Girl's Barbour 'The Snowman™' Chloe Knitted Beanie and Mitt Gift Set contains a cable knit beanie hat with a faux fur bobble to the top, and a pair of matching cable knit mittens. This gorgeously soft Barbour gift set is finished with a subtle branding tab featuring The Snowman™ from Raymond Briggs's iconic story. With a cute sparkle detail for that added touch of Christmas magic, the Barbour 'The Snowman™' Naomi Overlayer is perfect for the festive season! Crafted from 100% cotton for a soft and easy-to-wear feel, this Barbour children's sweater is finished with a lovely graphic print of Raymond Briggs's iconic Christmas story, The Snowman™. This Barbour sweater is finished with a crew neck, with a ribbed collar, hemline and cuffs for a neat fit. 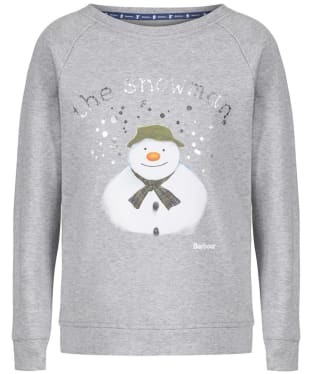 A cosy Christmas sweater they are sure to love, Barbour Kids 'The Snowman™' Howard Top is a great option for the festive season. 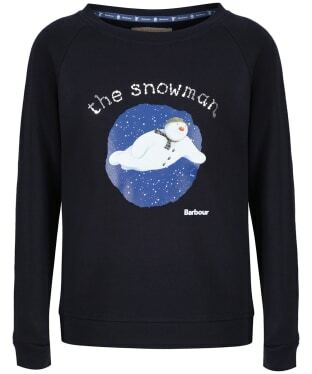 With a neat crew neck, which is ribbed for a comfortable feel, this Barbour top is finished with graphic print of The Snowman™ from Raymond Briggs's iconic story. Finished with a ribbed hemline and cuffs, this Barbour Howard Top is crafted from 100% cotton which will wash and wear beautifully. Featuring a gorgeous print from Raymond Briggs's iconic Christmas story The Snowman™, the Barbour 'The Snowman™' Scarlet Overlayer is a super soft and comfortable sweatshirt with a distinctive festive feel. Featuring sparkle detail for that added touch of Christmas magic, this 100% cotton sweater is finished with a ribbed collar, hemline and cuffs so that it will look and feel fantastic this season. 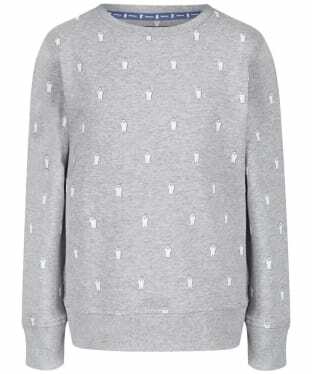 Women's Barbour Highland 'The Snowman™' Knitted Sweater is a festive sweater with a nostalgic twist! 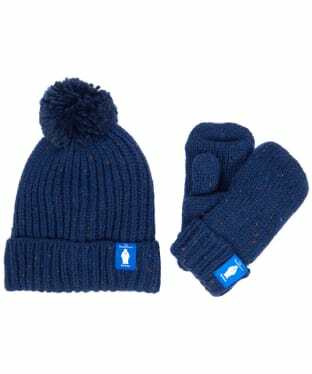 Complete with Raymond Briggs's iconic snowman, the Barbour Highland knit is sure to raise a smile this festive season for more than just its cute design. Crafted from a luxurious merino wool blend, this soft, round neck sweater is finished with split side seams for a comfortable relaxed style, and ribbed cuffs for a neat fit. 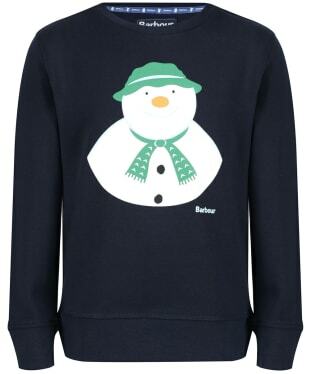 A premium Christmas jumper you'll be proud to own, this exclusive Barbour The Snowman™ sweater is not to be missed. A cosy Christmas sweater they are sure to love, Barbour 'The Snowman™' Howard Top is a great option for the festive season. 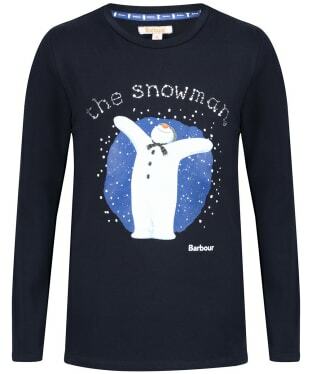 With a neat crew neck, which is ribbed for a comfortable feel, this Barbour top is finished with graphic print of The Snowman™ from Raymond Briggs's iconic story. Finished with a ribbed hemline and cuffs, this Barbour Howard Top is crafted from 100% cotton which will wash and wear beautifully. The Barbour Kids 'The Snowman™' Hamish Top is a stylish yet totally festive Christmas jumper for your little one this season! 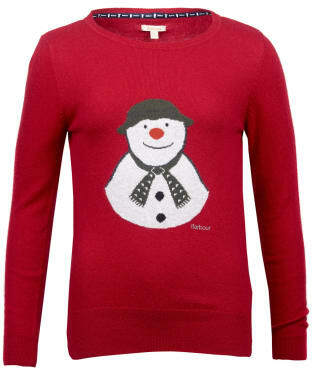 Complete with a repeated The Snowman™ pattern from Raymond Briggs's iconic story. Crafted from 100% cotton for a soft and comfortable feel, this crew neck sweater is finished with a ribbed collar, hemline and cuffs for a neat fit. 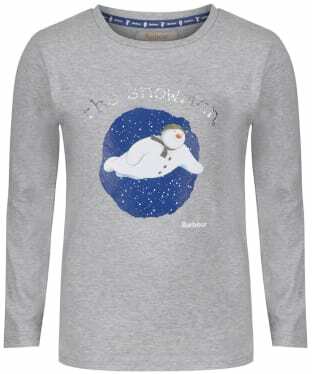 A lovely lighter weight alternative to the classic Christmas jumper, the Girl's Barbour 'The Snowman™' Elanor Tee features a soft round neck and long sleeves for a comfortable fit. The Elanor Tee features a graphic print of The Snowman™ from Raymond Briggs's iconic Christmas story with added sparkle for that touch of Christmas magic. Featuring a lovely festive print from the iconic Christmas story, 'The Snowman™', the Girl's Barbour 'The Snowman™' Chloe Tee is a soft, round neck t-shirt with long sleeves for the winter time. The stretch cotton construction offers a comfortable, soft feel, while still being a lighter weight alternative to the classic Christmas jumper. 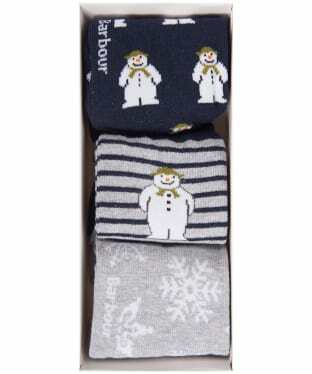 This Barbour Kids 'The Snowman™' Layton Sock Gift Set makes for a great stocking filler this Christmas! The gorgeously soft set of three patterned socks features three unique designs from Raymond Briggs's iconic Christmas story, The Snowman™. Crafted from a cotton mix with just the right amount of stretch, these are perfect everyday socks. A lovely lighter weight alternative to the classic Christmas jumper, the Barbour 'The Snowman™' Elanor Tee features a soft round neck and long sleeves for a comfortable fit. The Elanor Tee features a graphic print of The Snowman™ from Raymond Briggs's iconic Christmas story with added sparkle for that touch of Christmas magic. 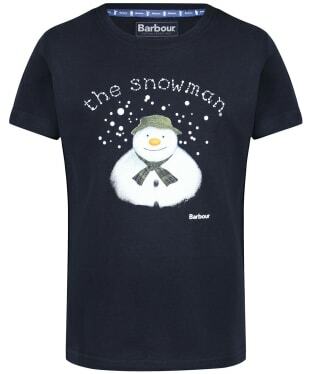 An easy to wear style that is a great alternative to the classic Christmas Jumper, the Barbour Kids 'The Snowman™' Blake Tee is a fun, nostalgic t-shirt featuring a graphic print from Raymond Briggs's iconic Christmas story. The Blake Tee is crafted from100% cotton for a soft and comfortable feel and is sure to raise a smile this Christmas.